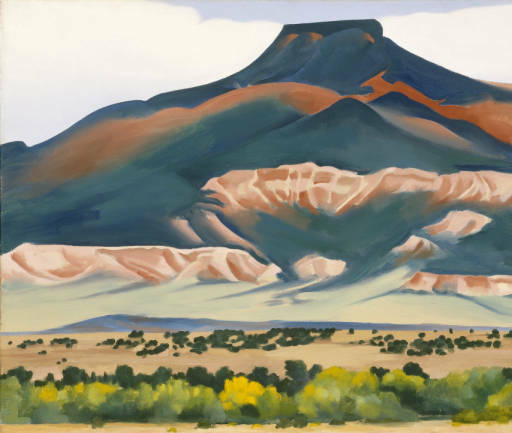 One of Georgia O’Keeffe’s largest sources of inspiration at Ghost Ranch is Cerro Pedernal, often known simply as Pedernal. 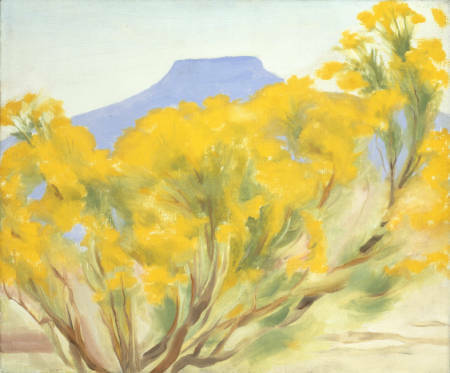 The uniquely shaped landform, a mesa that resembles a flattop mountain, served as an excellent subject to entertain Miss O’Keeffe’s keen interest in shapes as one of the defining elements of her artwork. 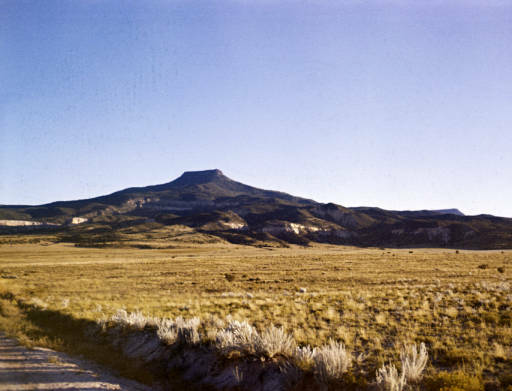 Pedernal’s height and narrow top cause it to stand out from the surrounding landscape, as do the slopes leading up to its summit, which curve elegantly before becoming imposingly steep just below the level precipice that caps the formation. 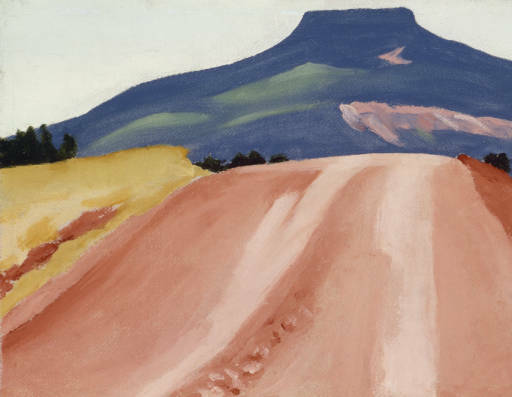 Another distinguishing characteristic of Pedernal is its dark coloring, which contrasts with the red, tan, and white hues of the cliffs to its east at Ghost Ranch. 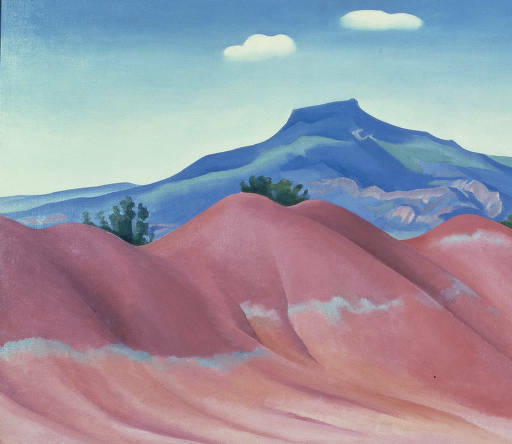 This startling color contrast between Pedernal and the surrounding landscape, along with its imposing scale, contributes to the formation’s establishment as one of the most iconic of Miss O’Keeffe’s subjects in its own right, as well as her use of it as a backdrop for depictions of many other objects. 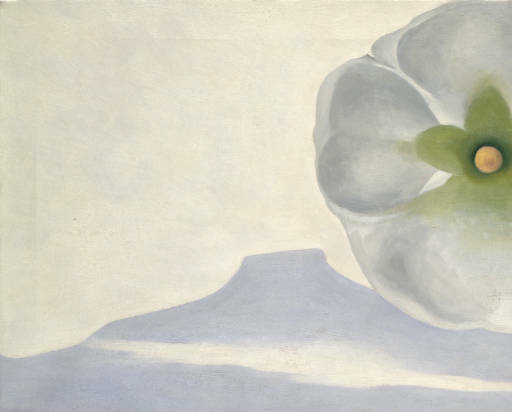 Miss O’Keeffe also exhibited her fascination with the shape of Pedernal by presenting it as a fully abstracted shape, free of its context in earthly reality. 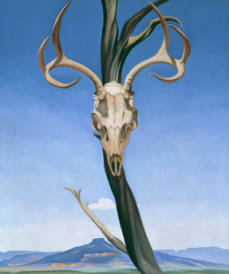 In several works, the formation appears to be of equal or lesser size as objects such as flowers and bones. In these works, Pedernal serves not as a backdrop for the other objects on the canvas to be set against, but as an equally regarded shape in an abstract plane where shapes and objects are not distinguishable by size or physical makeup. 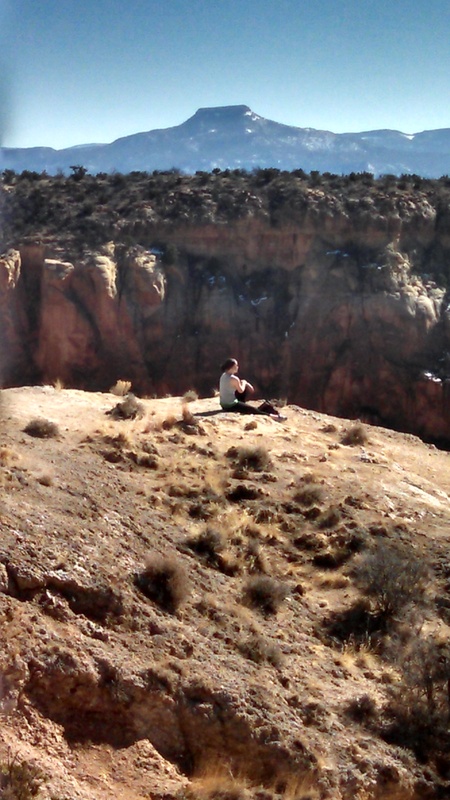 To experience the striking aesthetic effects of Pedernal on the landscape surrounding Ghost Ranch, the Kitchen Mesa and Chimney Rocks hiking trails provide the best views. I visited Kitchen Mesa this past weekend, when I took the photo below. Our view from the top of the trail demonstrated just how dominant Pedernal is over the area’s landscape, and it was truly a humbling experience that I would recommend to anyone.